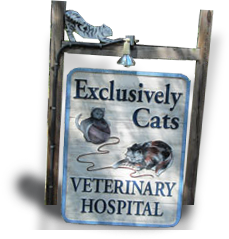 At Exclusively Cats, your cat will receive top quality veterinary services in a calm, feline-friendly environment. Whether you have a new kitten, a healthy adult cat, or a senior cat, we have the knowledge and experience to address your feline’s medical or behavioral needs. We have the honor of serving felines and “their people” throughout South Jersey and Burlington County, since many see the value of using a “cat-only” vet. Expert Veterinary Care—Dr. Nancy Dunkle is a longstanding member of the American Association of Feline Practitioners and has dedicated her professional life to the study of cats. An Appreciation of Your Unique Feline—We cater our approach to each of our patients and excel in treating felines of all temperaments, including sensitive or fractious cats. A Commitment to Both Clients and Patients—We deliver exceptional customer services driven by a passion for cats. A Feline-Friendly Setting—Our office, approach, and techniques are all designed to set your cat at ease. For your first visit to Exclusively Cats Veterinary Hospital, you will want to arrive 20–30 minutes early in order to fill out some patient information. If you prefer, you may fill out our new client form online or download our new client form in advance. We offer discounts to active military personnel and senior citizens. Ask for details. We encourage you to explore our website and to learn more about us. If you are ready to make an appointment, please call us at (609) 953–0100.